Pictures purported to be of Android KitKat 4.4 have been published, showing the changes Google has made to its mobile operating system. Google revealed the name of its next version of Android at the beginning of this month. KitKat is the first time the company has partnered with a brand to promote the operating system. The unconfirmed images show an interface with a slightly lighter colour scheme. There are also grey icons on the status bar, instead of the blue found in Jelly Bean and older versions of Android. They also show the status bar changes colour based on the app you have open. The images were published by 9to5Google. 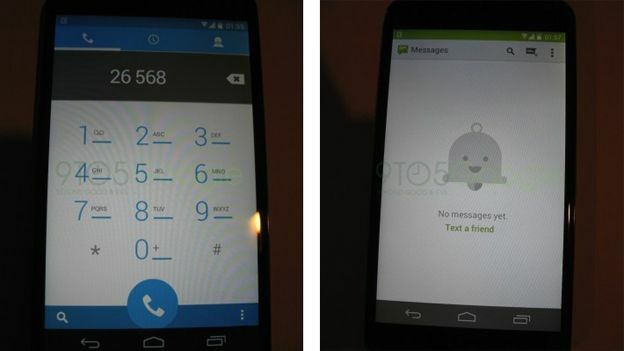 Other things revealed by the pictures show that the Messages and Phone apps have been redesigned. It is not possible to tell if there is any new or changed functionality. The first pictures of Android KitKat emerged last week after a Google engineer left an Nexus 5 on a bar. A member of bar staff took a video of the device, including the boot screen for Android KitKat. Google is expected to release Android KitKat next month. The rumoured Google Nexus 5 is expected to be the first phone that comes with the new version of Android. According to reports, Google is planning to host an event on October 14th.